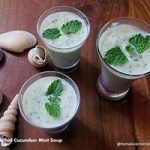 It was a chance that I saw this Chilled Cucumber Mint Soup thankfully with the temperatures soaring we all wanted a chilled drink. The kids are not too keen on plain buttermilk or majgi! I was not keen on store brought drinks. A search on google I ended up on Martha Stewart’s site. My fridge I had cucumbers and of course, I have curds or yoghurt always, mint grows in pots in my small balcony. I did not expect anyone to like this Chilled Cucumber Mint Soup but I was surprised when the girls drained it all. You cannot escape my love for history and geography so listen up, “Cucumber soups are traditionally from Poland. The cucumber soup is made from sour, salted cucumbers and potato or rice. A similar soup is also common in Russia andUkraine, where it is known as rassolnik.” Courtesy Wikipedia. Needless to say, this soup will be made again and again especially since I do not have to cook anything. Just blend (what a relief)! its simple enough for the girls to make it. Cut the cucumber into large chunks. Add to the food processor or the blender jar of the mixer the cucumber and dice fine. Next add garlic, yogurt, lemon juice (if using) and water and puree until quite smooth. Add mint leaves, reserving some of the mint for garnish, and puree again. Serve garnished with a sprig of mint.